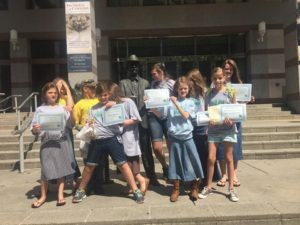 Sponsored by the NC Museum of History, the Smith McDowell House chapter of the Tar Heel Junior Historians Association is a vital part WNCHA’s programing. The club is open to school-age boys and girls and meets on the 2nd Thursday of each month at 3:30 pm (August – May). Members recieve two magazines per year from the NC Museum of History and there are opportunities in the State Contest program. (see below for the link to the state club). The club is open at any time in the year to school-age students (grades 1 – 12)There is a small registration fee of $10 ($5 for each eligible sibling) that helps to defray some costs of programming and supplies. Parents generally participate in the meetings and younger siblings are welcome. New members are always welcome to visit for a couple of meetings before making the decision to join. 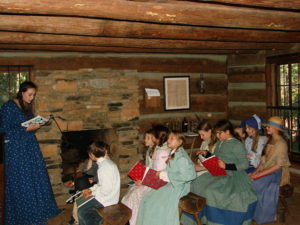 Reenactment of a One-Room Schoolhouse at Hart Square in Hickory, NC. We do this in period costume with teenage members as teachers. 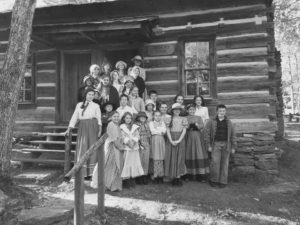 Appalachian Music – Members who play instruments are encouraged to bring their instruments to meetings and learn traditional Appalachian songs. We also are learning to sing with shaped-note music. Smith-McDowell House – Members learn about the history of the House and participate in various volunteer opportunities such as operating some of our hands-on tools and machines (like the butter churn, the corn sheller and grinder and washing machine) on Living History Day. Our members are also called upon to act as assistants with the Crafty Historian events on 3rd Saturdays and other events. Service Project – We participate in the History In Action Award program from the state Tar Heel Jr Historians Association. Our 2017 project is to research and photograph communities in Buncombe County that will lead to developing a lesson kit that teachers can check out from WNCHA to help Buncombe County students learn about their county and their communities. THJH Association State Contests – There are a variety of categories such as Essays, Artifact Find, Photography, Poetry, Literature and Art. Rules and requirements are designated by the THJHA and detailed information is available in late Fall. For information visit the state-wide THJH club.